You should use this guide after registering and setting up your pension scheme with NEST. If you have not yet set up your scheme with NEST then please refer to our guide Setting the ‘Payment frequency’ and ‘Earnings period’ on the NEST website first, which has been designed to help with part of the NEST setup procedure. This guide is specifically designed to show how Payroll Manager can help with the Auto-enrolment process and is split into 6 sections. It is very important that you go through the setup procedure correctly in order to avoid problems later. 4. Adding Employees and setting contributions. Re-enrolment date – Leave this field blank at this stage. (Re-enrolment relates to the automatic enrolment of workers who may have opted out of your pension scheme, and does not take place until 3 years following your staging/duty start date). Defer/postpone until – If you are using postponement to postpone automatic enrolment for all of your employees from your staging/duty start date then enter the relevant date in this box, otherwise leave this field blank. Online filing username – Enter your NEST Username. NEST have a number of different services, so it is very important that you enter exactly the same ‘Username’ that you use to log onto the NEST website. Online filing password – Enter your NEST Password. NEST have a number of different services, so it is very important that you enter exactly the same ‘Password’ that you use to log onto the NEST website. Use the same username and password in all data files – if you are a payroll agent and wish to use the same ‘delegate’ NEST username and password in all client files then tick this box. 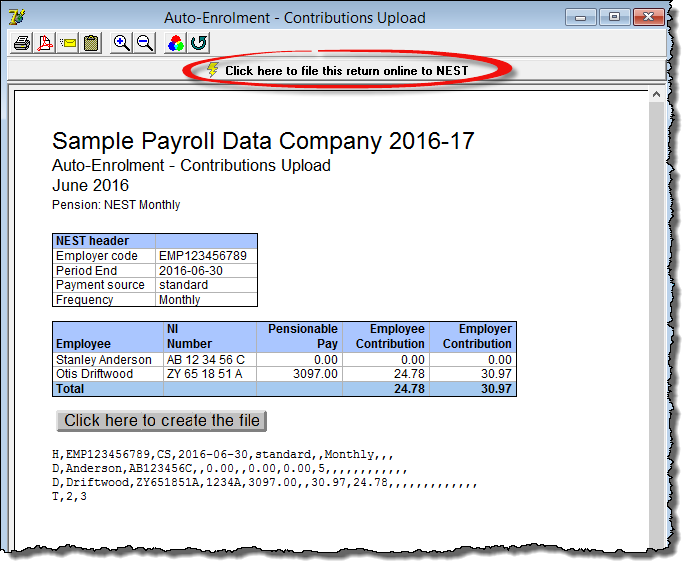 The remaining boxes on this screen have been added in order to match the output generated by Payroll Manager with that expected by NEST when uploading contribution information. You may find that you need to make some initial adjustments on this screen depending on how your NEST scheme has been set up. Report frequency as “Tax Monthly” instead of “Monthly” – (N.B If you don’t have any monthly paid employees then you can ignore this box). As part of the initial setup procedure on the NEST website you would have been asked to specify the payment frequency of your employees. For monthly paid employees, NEST (confusingly) allows you to choose either ‘Monthly’ or ‘Tax Monthly’ as the payment frequency. You should log on to the NEST website and go to the ‘Manage Contributions’ section to see which pay frequency you have specified. If the Payment frequency column on the NEST website shows ‘Monthly’ (as in the example below), then you should leave this box in Payroll Manager unticked. If the NEST website shows a Payment frequency of ‘Tax Monthly’ then you need to tick this box in Payroll Manager. This setting has no effect on payroll calculations, but does help to ensure that communications with NEST are successful. Report frequency as “Tax Weekly” instead of “Weekly” – (N.B If you don’t have any weekly paid employees then you can ignore this box). As part of the initial setup procedure on the NEST website you would have been asked to specify the payment frequency of your employees. For weekly paid employees, NEST (confusingly) allows you to choose either ‘Weekly’ or ‘Tax Weekly’ as the payment frequency. You should log on to the NEST website and go to the ‘Manage Contributions’ section to see which pay frequency you have specified. If the Payment frequency column on the NEST website shows ‘Weekly’ (as in the example below) then you should leave this box in Payroll Manager unticked. 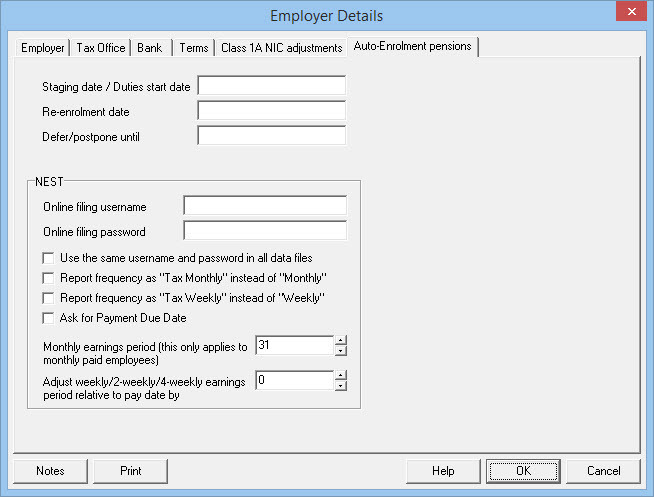 If the NEST website shows a Payment frequency of ‘Tax Weekly’ then you need to tick this box in Payroll Manager. This setting has no effect on payroll calculations, but does help to ensure that communications with NEST are successful. Ask for Payment Due Date – leave this box unticked. NEST previously asked that you report this information but have recently updated their systems so that it is no longer required. Monthly earnings period – As part of the initial setup procedure on the NEST website you would have been asked to specify what NEST refer to as the ‘earnings period end date’ for monthly paid employees. You should log on to the NEST website and go to the ‘Manage Contributions’ section to see which date you have specified. It is the last day of the earnings period that is important. In the example below, the last day of the calendar month has been specified, and so the ‘Monthly earnings period’ in Payroll Manager should be set to ’31’ (Payroll Manager will automatically adjust for months which have less than 31 days). If you don’t have monthly paid employees then please ignore the contents of this field. Adjust weekly/2-weekly/4-weekly earnings period relative to pay date by – As part of the initial setup procedure on the NEST website you would have been asked to specify what NEST refer to as the ‘earnings period end date’ for weekly (and/or 2-weekly and 4-weekly) paid employees. You should log on to the NEST website and go to the ‘Manage Contributions’ section to see which date you have specified. It is the last day of the earnings period that is important. In the example below, the pay frequency is weekly and the last day of the earnings period is 31 August 2016 (a Wednesday). 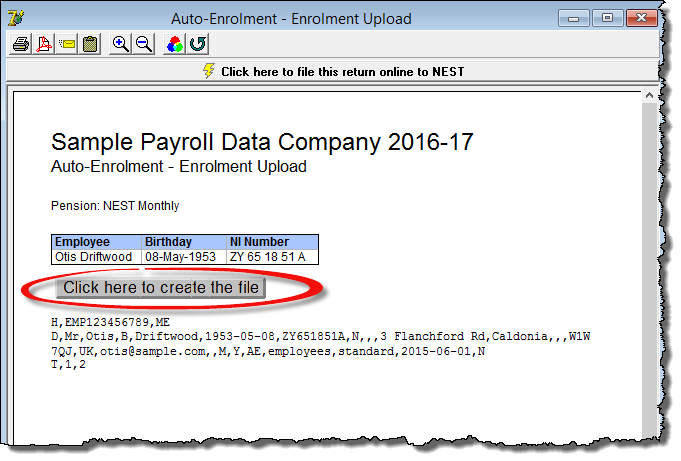 If the pay date you have set in Payroll Manager matches with the pay date on the NEST website then no adjustment is needed, otherwise you may need to make adjustments on this screen when it comes to uploading files to NEST. If you don’t have weekly/2-weekly/4-weekly paid employees then please ignore this box. Click ‘OK’ to save this information. 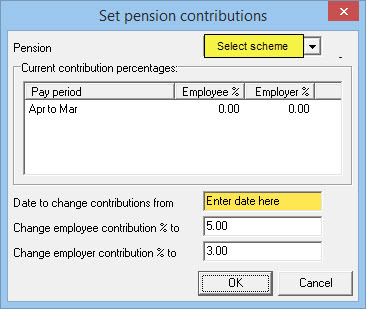 Click ‘Pensions’ from the main menu, then click ‘Pension Scheme Details’. The tabs along the top of this screen allow you to add the details of up to 5 different pension schemes. VERY IMPORTANT: If you have employees that are paid at different pay frequencies (e.g. some weekly and some monthly paid employees) then you should create a separate pension scheme within Payroll Manager for each pay frequency and name them accordingly (e.g. ‘NEST weekly’ and ‘NEST Monthly’). Name – This is the name by which you wish to refer to the pension scheme. This will appear on the Pay Details screen and on all reports. You should enter ‘NEST‘ (or e.g. ‘NEST-weekly’ if you have multiple pay frequencies) in this box. Provider type – Select ‘NEST’ from the drop-down list. Payment Source – When setting up your details on the NEST website you would have been asked to specify a ‘Payment Source’. You must enter the name of the payment source here in exactly the same format as that used on the NEST website (n.b. this field is case sensitive). Tax relief – select Basic rate tax relief at source. It is very important to have this set correctly at this stage as this setting affects the calculation of pension contributions and cannot be changed later. Additional Voluntary Contributions (AVCs) – Leave the ‘This pension has AVCs’ option unticked (NEST do not allow for AVCs). Include all employees in contribution files (even if they have not joined or opted in) – leave this box unticked (it is used for some other pension schemes). % apply to all pensionable pay – If you wish the pension contribution to be calculated on all pensionable earnings (i.e. from the first pound of pensionable earnings) then tick this box, otherwise leave it un-ticked. % apply to banded qualifying earnings only – If you wish the pension contribution to be calculated on qualifying earnings only – i.e. those earnings falling between the Lower and Upper thresholds for automatic enrolment then tick this box, otherwise leave it un-ticked. (The bands for 2019-20 are £118 - £962 for weekly paid employees and £512 - £4167 for monthly paid employees.) This is the most common setup for a NEST pension, however if you are not sure how your particular scheme operates then you should contact NEST (Moneysoft cannot tell you how your particular scheme operates). The fields on the top right hand side of the screen (Address, Postcode, Telephone etc.) are not used for auto-enrolment purposes and so can be left blank. If you wish to, you could record your pension scheme details here for reference. 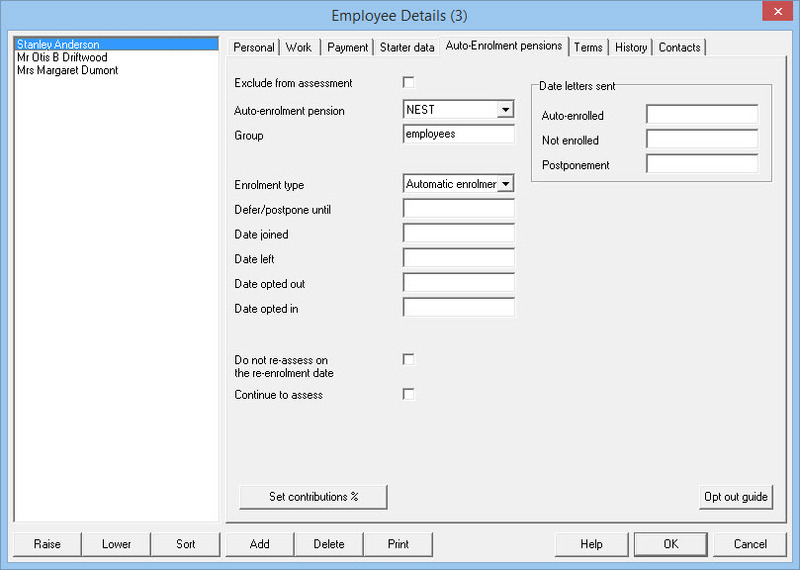 After following the Assessment procedure you can then add the relevant employees to the pension scheme. The following details need to be set for each employee that is joining the NEST pension scheme. Do NOT complete these details for employees that are not joining the scheme. Exclude from assessment – Leave this box un-ticked. If you have individuals on the payroll that are not deemed to be subject to Workplace Pensions Legislation (e.g. they are not ordinarily working in the UK) then you can exclude them from the assessment process by ticking this box. You should consult The Pensions Regulator documentation before selecting this option. Auto-enrolment pension – Choose the appropriate pension scheme from the drop-down list i.e ‘NEST’. You should only set this field for employees that are being auto-enrolled, opting-in or joining the pension scheme. Leave this field blank for all other employees. Group (This field MUST be completed for each employee that is joining NEST) – When setting up the employer information on the NEST website you would have been asked to create at least one ‘group’ in which to place each worker. You should enter the group name here and it must exactly match that entered on the NEST website (i.e. it is case sensitive). You should log on to the NEST website and select ‘Manage Groups’ to check the group name that you have chosen. Enrolment type (This field MUST be completed for each employee that is joining NEST) – The enrolment type of the worker is determined by whether they’re enrolling as a result of automatic enrolment or voluntarily. Choose the appropriate category from the drop-down list. Opt in – For Non-eligible Jobholders or Eligible Jobholders during a waiting period. Worker without qualifying earnings – For Entitled Workers. Others – Only for use in exceptional circumstances – Please speak to NEST for further guidance. Date joined (This field MUST be completed for each employee that is joining NEST) – Enter the date from which the workers enrolment in the pension scheme is effective. This is usually the date that the worker becomes eligible for automatic enrolment. Date left – If the employee leaves the pension scheme then enter the leaving date here, otherwise leave this field blank. Date opted out – If the employee has opted out of the pension scheme then enter the opt out date here, otherwise leave this field blank. Date opted in – If the employee wishes to opt in to the pension scheme then enter the opt in date here, otherwise leave this field blank. Do not re-assess on the re-enrolment date – Leave this field blank at this point. Re-enrolment is a procedure which takes place 3 years after the staging/duty start date and applies to employees that have previously opted out of the pension scheme. Employees that opt-out within 12 months prior to to the re-enrolment date do not need to be assessed at this point – in which case you would tick this box. A report is available which allows you to check that all employee pension details have been input correctly. Click ‘Pensions’ from the main menu and then ‘Employee Pensions Report’ to produce this report. Entering information directly online – If you wish, you can manage the whole process of adding employees and informing NEST of their pension contributions by logging in and typing this information directly on the NEST website. If you only have a small number of employees then you may find this the best option. You should speak to NEST or consult the NEST Help Centre website for more information about how to do this. If you choose to use this method then you can ignore the remainder of this guide. NEST Web Services – Allows Payroll Manager to communicate directly with NEST to send enrolment, contribution and payment information. 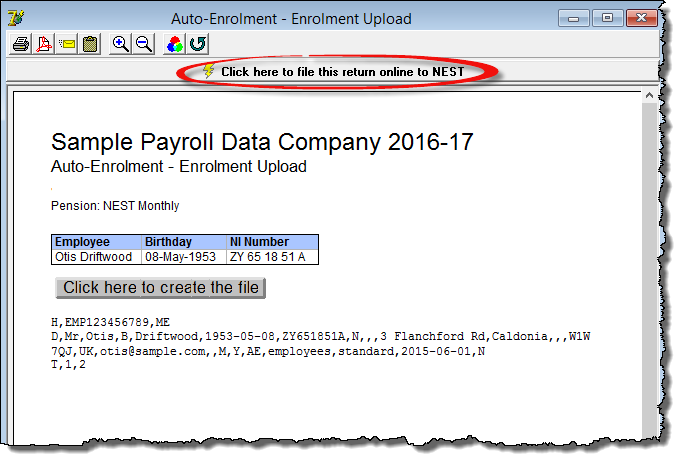 CSV file upload – Payroll Manager is able to produce two types of ‘csv’ file (one for enrolling employees, the other containing details of their pension contributions) which you can then upload by logging on to the NEST website (as an alternative to using NEST web services). Details of how to produce these csv files are given below. You should speak to NEST or consult the NEST Help Centre website for advice on how to upload these files. SFTP (Secure File Transfer Protocol) – This method of file transfer is NOT supported by Payroll Manager, and has been designed by NEST primarily for large employers who need to send details of thousands of employees at a time. ‘Enrol workers’ – Sends all worker enrolment data direct to NEST. ‘Update contributions’ – Sends NEST the earnings and contribution details for a particular contribution schedule / pay period. ‘Approve for Payment’ – Sends NEST an employer’s confirmation that payment of a contribution schedule for an agreed amount will be made by the employer (e.g. BACS, CHAPS or Debit Card) or can be collected by NEST (Direct Debit). 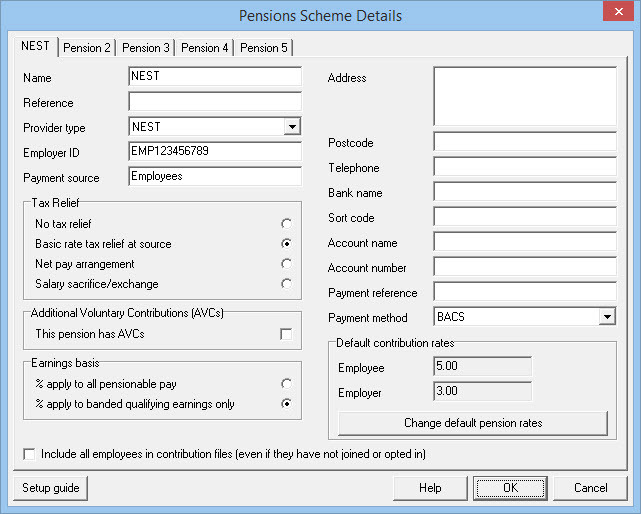 From the main menu click ‘Pensions’ then ‘Generate upload files’ then click ‘NEST’ and choose the ‘Enrolment’ option. Select the employees that you wish to include in the submission and click ‘OK’. The report shows all employees to be included in the ‘Enrol Workers’ submission, together with their date of birth and NI number. In practice the actual submission contains more detailed information. Payroll Manager will run an internal validation routine on your data. You may find that you have to provide additional information (e.g. employees ‘title’ or extra lines of address) in the Employee Details section of the software in order for NEST to accept your submission. 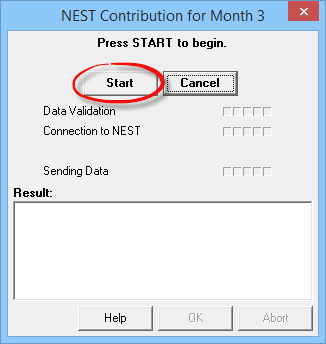 Click on the ‘Start’ button to submit the information to NEST. Payroll Manager will report back on the status of the submission, and will store this information in the Submission Log (Click ‘Tools’ then ‘Online Filing’ and select ‘Submission Log’ if you wish to see these details). You should always check the details of the NEST response message to see if NEST have sent back any errors. If you wish you can check that the submission has been successful by logging on to the ‘Manage Employees’ section of the NEST website. Make sure that you have the correct pay period selected on the ‘Pay Details’ screen, then from the main menu click ‘Pensions’ then ‘Generate upload files’ then click ‘NEST’ and choose the ‘Contributions’ option. The report shows which employees will be included in the ‘Update contributions’ submission, together with their NI number, Pensionable pay and Employee and Employer pension contributions. Click the button along the top of the report marked ‘Click here to file this return online’ (NOTE: You should ignore the button on the report marked ‘Click here to create the file’, as this is only used for creating csv files, and is not used with NEST Web Services). If you wish you can check that the submission has been successful by logging on to the ‘Manage Contributions’ section of the NEST website. IMPORTANT: You also need to authorise the payment of these contributions via the NEST website when you are ready to do so. The ‘Approve for payment’ NEST web service (details below) allows you to do this. This web service is an employer’s authorisation that the total amount payable is correct and is authorisation for payment of the contribution schedule for that amount. For BACS, CHAPS or Debit Cards, the employer is agreeing that they will make a payment for that amount. For Direct Debit, the employer is instructing NEST to collect that amount by Direct Debit. IMPORTANT: You must already have used NEST Web Services (and not any other method) to submit a successful contributions upload to NEST in order to use this service. Make sure that you have the correct pay period selected on the ‘Pay Details’ screen, then from the main menu click ‘Pensions’ then ‘Generate upload files’ then click ‘NEST’ and choose the ‘Approve for Payment’ option. Payroll Manager will show the total contributions due (employee + employer) for that period. Click the button marked ‘Click here to file this return to NEST’ to approve the payment to NEST. If you have a direct debit set up with NEST then the ‘Approve for payment’ submission instructs NEST to collect the relevant pension contributions. Please note that it can take 5 working days for NEST to actually collect the payment after you have instructed them to do so, and you should bear this in mind when submitting the return. If you receive an error message whilst attempting to upload information to NEST then please refer to our NEST Error Guide. You may find that you have missing or incorrect information which is stopping the submission from being successful. 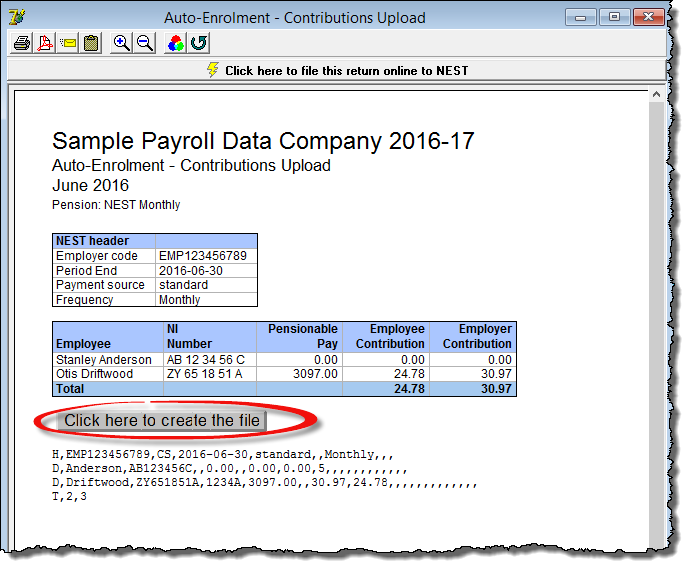 If you are unable to use NEST Web Services (above) for whatever reason then you may choose to generate csv files from Payroll Manager for uploading to the NEST website. A file for enrolling workers into the pension scheme (which Moneysoft calls the ‘Enrolment’ file). A file containing details of the employee and employer contributions (which Moneysoft calls the ‘Contributions’ file). Select the employees that you wish to include in the file and click ‘OK’. The report shows which employees will be included in the csv file, together with their date of birth and NI number. In practice the file contains more detailed information, and a representation of how the csv will ‘look’ is shown at the bottom of the report. Click the button marked ‘Click here to create the file’ and save it to an appropriate location. You can now upload the csv file from the ‘Manage Workers’ section of the NEST website. You should contact NEST if you require support on how to do this. IMPORTANT: You should not use Excel (or any other spreadsheet software) to open your csv files after creating them as this may reformat some fields which could result in NEST rejecting the file. You can now upload the csv file from the ‘Manage Contributions’ section of the NEST website. You will also need to authorise the payment of these contributions via the NEST website when you are ready to do so. You should contact NEST if you require support on how to do this.